Here at WOVEMBER we recognise the importance of the wool journey and we have been very lucky to have had such insightful contributions looking at sheep farming. 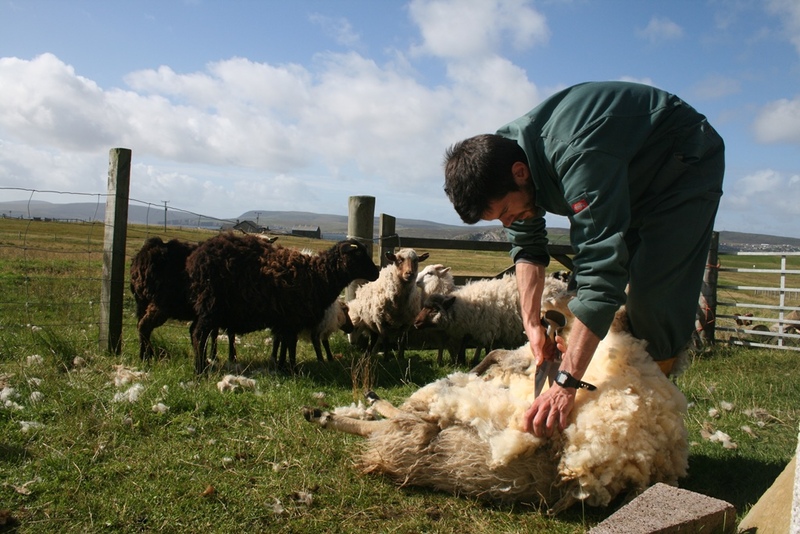 In today’s post we look at the experiences of first time crofter Chris Dyer. 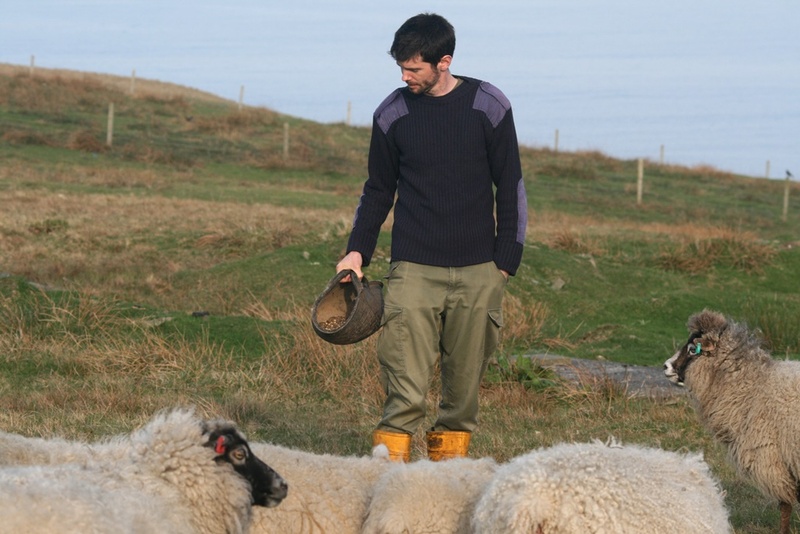 Originally from London, archaeologist Chris decided to take over a croft in Bressay, Shetland and raise Shetland sheep. 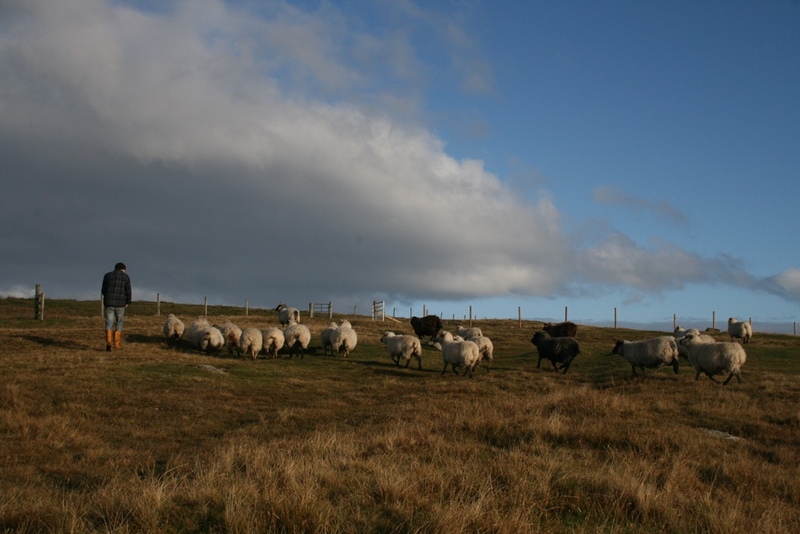 Here he talks about the challenges and rewards of setting up the croft and his first shepherding year. Accompanying this are his wonderful pictures of his sheep, croft and the lovely landscape of Bressay. This piece was written in the spring and was originally published in 60North Magazine. Living in Shetland provides the perfect opportunity to immerse yourself in a landscape. Natural heritage and elements of human history are immediately apparent; some are visible, others lie tantalisingly over the horizon whilst yet more can be evocative sounds of calling moorland birds or the smell of coastal flowers at the banks on a warm summer evening. It is one thing to appreciate the environment but another to have direct responsibility for an area, however small, and to work with it on a daily basis. 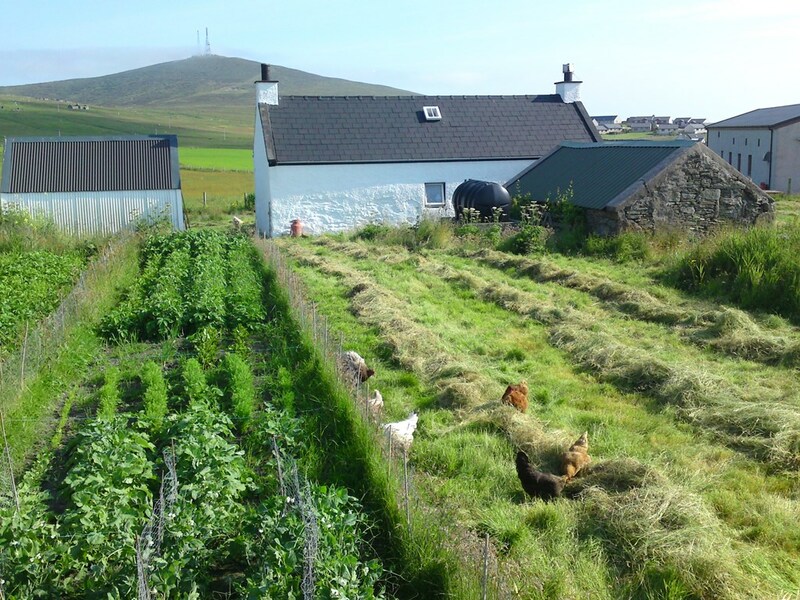 Over the past year in Bressay, a friend and I have been fortunate enough to begin our crofting lives, replete with enjoyment, challenges and variable weather! The east side of Bressay is a world away from the magnetic pull of Lerwick. Fine coastal walks can be taken over hill and heather to the Great War guns at the Bard and Aith, passing generations of historic settlements, whilst a familiar stomp in summer months takes you to the inflatable ferry across to the National Nature Reserve of Noss. The croft of Bruntland overlooks the Voe of Cullingsburgh, out towards an Iron Age broch, historic chapel site, and early twentieth century Admiralty watchtower at the summit of Ander Hill. 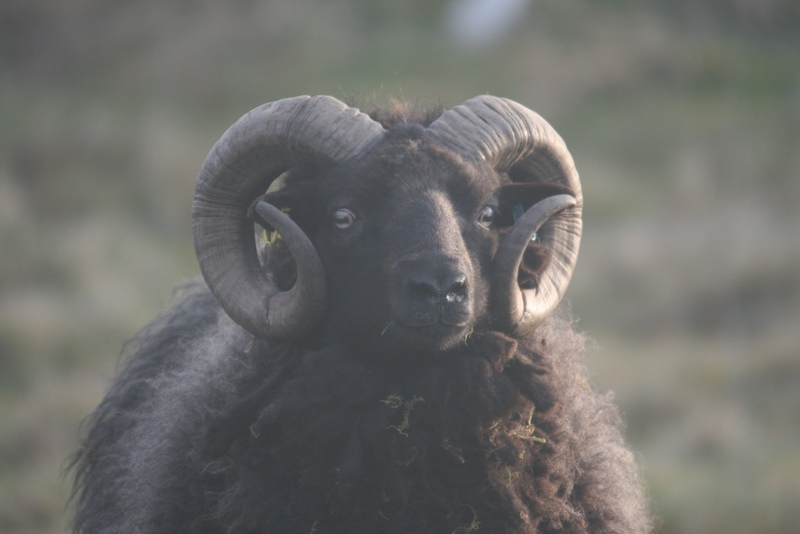 Just under 40 acres in size, it’s a grand place to run two dozen Shetland sheep and concentrate on breeding interesting colours, good quality fleeces and, of course, something for the freezer. Having formally decided that we were going to acquire a few animals, there was a disconcertingly long list of ‘things to do’ in advance of the first trailer and clatter of hooves arriving. A succession of Sunday mornings early last year were spent with cups of tea and notepads endeavouring to detail what we wanted and what was truly needed. Listening to advice from those with years of experience was, and continues to be, vital and influenced the guiding idea which has been to keep stocking levels low to ensure animal welfare whilst mitigating for the absence of a good sheepdog. A small flock is much more likely to get to know you and once the mental connection is made between you and the rattle of a bucket containing ewe nuts or barley blend, they will follow with enthusiasm. Fences are of paramount importance, as any stockman, farmer or crofter will tell you and represent the difference between resting easy at night and worrying about potential escapees! A summer job was the replacement of several stretches of fencing at the croft which were in danger of imminent collapse should ‘a coo sneeze’ on them. Strainers were dug in and braced before the wire could be unrolled, tensioned and stapled to new fence posts. Note: the hard bedrock is nearly always where you try to dig and generally does not yield to a fencing mallet! A galvanised field gate was also purchased which would provide a point of access between two of the larger parks at the croft. This would enable us to bring the sheep within view, closer to the house, for tupping and lambing, whilst letting them out of sight, if not out of mind, at other times of year to get to the banks and graze ad infinitum. But what if there was snow? Whilst not a conventional question for late July, this pre-emptive concern was the catalyst for haymaking to provide supplementary winter fodder and bedding for lambing pens. The smaller park was cut with a traditional scythe which brought a sweating brow and a feeling of nothing but respect for the pre-industrial age. Fortunately, for the larger park, the loan of a Massey Ferguson 35 complete with driver and finger bar mower, in return for several bottles of beer, achieved in 20 minutes what would otherwise doubtless have taken a day. The sweet smell of the grass on the first evening after being cut remains an abiding memory. After a couple of days of dry weather, the grass was manually raked into long rows which, the theory intimated, would be turned as and when the weather permitted until the greenish colour had faded and the hay could be baled. The practice was very different as frequent mist coupled with occasional heavy downpours conspired against agricultural ventures and necessitated a number of rueful ‘back to the drawing board’ journeys with the hay rake into the parks to spread out the damp grass. A window of potentially dry, if not overly warm, weather in early August was a cause célèbre for all Shetland haymakers. What mattered was the constant, gentle wind which, with repeated turning, permitted the hay to be stacked and then baled manually by compressing in large fish boxes through which twine was fed to create a small, handheld bale. A time-consuming and slightly Heath Robinson approach but one which, in the absence of machinery, provided the means to an end which was gleefully consumed by the flock during the short-lived snow cover of last December. The Bruntland flock arrived in three journeys from two sources in September and was preceded by copious reading of the rules and regulations concerning tagging, medical records and movement documents. 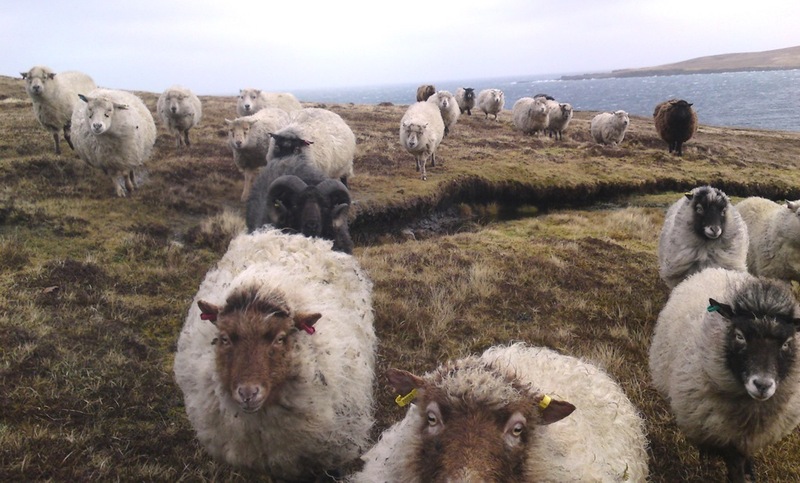 A friend at Cuckron, Stromfirth had 16 whilst another in Bressay had a further 8 which, in lieu of payment, could be taken in return for clipping giving a total of 24 Shetland sheep, some white but the majority displaying forms of colouring. These two flocks, one from the mainland and the other the island, continued to keep their distance from each other when brought under the yoke of a single holding, each unsure of the other akin to the girls and boys at a school disco. It has only been with the onset of winter, and the allure of extra feeding, that a merger has taken place and a single grazing identity formed. Although tolerant of the human presence that surrounds them, the flock routinely needs to be brought together. The overgrown turf floor of an old outbuilding at the croft was stripped out, drainage installed and a recycled flagstone floor laid to accommodate the flock which may be caa-ed [driven] together for a variety of purposes such as trimming feet, dosing for fluke and worm and administering a copper and cobalt supplementary mineral drench. There seems a grudging acceptance of the need to be periodically gathered, for the greater good, similar to a trip to the doctor. Significantly, a flock cannot remain static, it must grow and with this maxim in mind, a ram was sought and purchased. ‘Nero’, or ‘Stinky Jim’ as he has been christened by the bairns of the family with which we share him, is a three year old black Shetland tup with a muckle pair of horns and the strength to pull me along on my knees when trying to catch him prior to loading into the trailer. He took an instant liking to the flock with which he spent 6 weeks from early December. By the New Year, he seemed more interested in grazing than spending time with his admiring harem, a sure sign that things had come to their logical conclusion. This serenity was only broken once when a ewe from the hill that borders the croft came to the fence seeking an introduction with the ram who made clear his disdain for the fence that kept them apart. Fortunately the fence held firm and he was caa-ed into a park away from temptation. We are expecting lambs from early May. 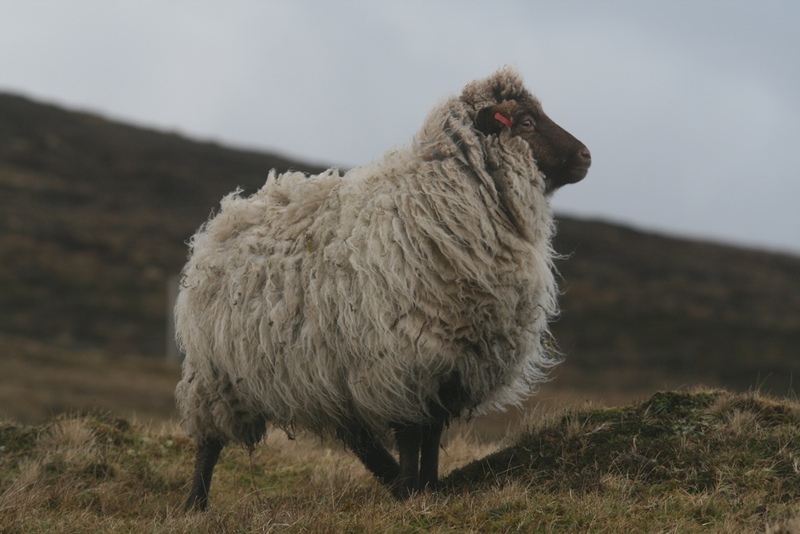 The principal jobs in the interim will comprise feeding and routine animal care but the hardiness of the Shetland sheep makes this a lighter task when compared to the bigger-framed, more demanding first-cross Cheviot, Texel and Suffolk breeds. The intention is to retain ewe lambs for future breeding stock and possibly seek to replace some of the older ewes in the flock come Hairst and the marts. However, even by this time, our agricultural year will be covering ground previously encountered in terms of clipping and haymaking. Walking the banks in early October last year, having recently acquired our animals and watching them graze, a basking shark surfaced in the Voe of Cullingsburgh and silently explored the bay against the silhouette of the Ander Hill watchtower. Nature and history were intertwined wherever the eye was cast, as they always are in the peaceful, open spaces of Shetland. This article originally appeared in 60North magazine, Spring 2014 and this is available to view online or purchase in print at www.shetland.org/onlinemag. Many thanks to Chris and PromoteShetland for the kind permission to reproduce it here.